“We are mega. And you are Brentwood. How do we know that you are Brentwood and we are mega? Because I am wearing a f*** off pretend snakeskin suit and [they] are wearing f*** off cowboy shirts even though they live in London. On the other hand Brentwood, you are wearing wall to wall f*****g Primark. Posted in Misc and tagged Bob Geldof at 4:08 pm on July 21, 2016 by Broadsheet. Wearing Primark and chatting to each other during the gig about whether to go for the Kia or the Hyundai when the third one is born. So cunning of him to disguise the fact that he’s an irritating prick until now? Get off the stage you talentless clown Bob. You’re urinating all over your own, already shaky, legacy. Fupp that bloke…. rock and roll festival = cheap and easily abandoned clothes. Not everyone has a dressing room and private toilets. What was the final figure on the refugees he took in? And they call themselves a newspaper. But he’s OK to shop in IKEA, the Primark of furniture n stuff store. Comedian! Ireland is a feeling…said he….not a country….thanks Bob. Condescending west-brit nob jockey. He will be buried with an embarrassed silence. He did the state some service. We know it. No more of that! Remember when he used to be a scruffy failed pop star tramp who seemed only to want to feed the third world? What happened to that guy? Rock and roll festival stuff aside, Primark is one of the worst exploiters of people in the developing world on the high street. It’s only 3 years since the Rana Plaza collapse. 2 years since the cry for help note in the pair of trousers. Buy cheap clothes, support cheap labour and exploitation. Despite the previous comments, I get where he’s coming from. Punk is dead, and a major element of punk was the fashion, but wearing fake snakeskin doesn’t make you a punk Bob. The unfortunate thing is that Punk is exactly what we need today to fight the ever increasing bigotry and the rise of new Thatcherism under May, but we have people who are more obsesed with fupping imaginary creatures on their phones than they are with the robbing of their society and future from under their feet. We live in a consumer obsessed dumbocracy. Any youth movement today gets branded and mainstreamed almost immediately so a quick dollar can be made from it. Depressing really. Lazy – first woman PM since Thatcher therefore.. Is she more like Thatcher than John Major say, apart from her genitalia? What happened in Bangladesh has changed how primark/penneys operates. They now have much tighter regulations when it comes to factories they use or companies they outsource use. You can’t just swan in here and say something as ridiculous as ‘Punk is dead, and a major element of punk was the fashion…and in the following sentence say ‘Punk is exactly what we need today…. It just makes you seem confused. Watch out for the imaginary Punkémons and stay cheerful. We need Crass/ Conflict style anarcho-punk. It’s still around. Underground as always. On it’s way back. Theresa May will help. I want the Sigue Sigue Sputnik future I was promised. When Dún Laoghaire goes bad. 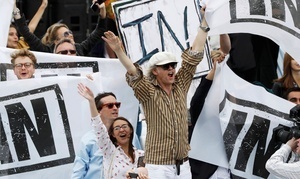 Geldof has the street cred of William Hague wearing a baseball cap. Hahajahaha ty for that :). 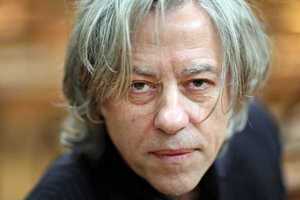 Jaysus that Geldof fella would sicken your hole. At least he does not insist on being called, Sir Bob. I’d say bodger loves you. The Donald Trump of punk. Well has the hair for it. 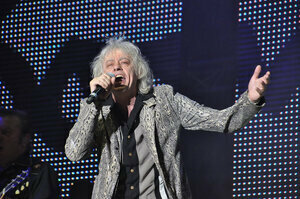 The Boomtown Rats were never ‘punk’. They were a pub band who struck lucky with a gobby frontman. 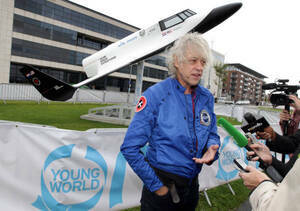 Geldof is a professional ‘poverty’ campaigner. “ANTI-poverty campaigner Sir Bob Geldof has charged Australian organisers $100,000 to give a speech about world suffering. Geldof, 54, spoke about the tragedy of Third World poverty and the failure of governments to combat the crisis at a Crown casino function in Melbourne on Thursday night. But he charged about $100,000 for his troubles – a speakers fee that included the cost of luxury hotel rooms and first-class airfares. Maybe it was an over egged attempt to cover up for his Battle of the Thames escapade, which spectacularly backfired. As in I’m not just rude to unemployed fishermen – I’m rude to everyone -In a, so get over it, kinda way. Perhaps he’ll end up back over here – telling us he hates the Brits, who have no sense of humour and don’t understand his wild Oirish spirit like. He could even enjoy a coupla pints with Bono every now and then. And do the Late Late. Aaaargh, please not that – I’m depressed enough. I was feeling nauseous as I typed it out. So… Who’s in? Who’s allowed? Of those who’ve made a name for themselves, who do those who play here deem sound? Jusaskin….. Cheers. Some funny comments back then. He has lost a lot of support since then. If only he kept his mega mouth shut.. Following Bob’s rants is now entertainment in a Prince-Phillip’s-racist-gaffs / Oliver-Reed-drunken-TV-appearances kind of way. Poor Bob, shouting at people on a boat on the Thames pre Brexit didn’t get him the publicity he wanted. I’d say he’s down to the last of his confirmation money now and needs to be back in the papers. His 1980’s mentality of if I say a few F words I’ll seem cool unfortunately just displays that he’s an old fart and people left not because of his expletives but that his music is poo and he still can’t sing. lets see your famine relief awareness fundraising work or the numerous hit records you’ve penned. Always surprised at how many people have the knives out for Bob. Fair enough he says some cringeworthy things, just can’t believe nobody would consider cutting him some slack considering what he’s done and been through. What does this teach us? That philantrophists and idealists are often misguided and naive. We knew that already. Thanks. OBE, MBE, CBEs etc are handed out for helping the state. If that means telling British, Scottish or Irish how to vote they good ol sir bob does exactly as asked. This is why I don’t like him. Too late god isn’t a bad tune.